The National Archives and Records Administration is now officially open for business at its new facility. The new address is 17101 Huron Street, Broomfield CO 80023-8909. Textual and Genealogy Research rooms are open Monday through Friday 8:30 a.m. to 4:00 p.m. It is closed all Federal Holidays. Its new phone number is 303-604-4740. On the 3rd Saturday of each month CSHG offers a Presentation to our members and guests. Meetings are held at Christ the King Lutheran Church hall located at 2300 South Patton Court, Denver, CO. The General meeting held at 1 p.m. followed by the presentation at 1:15 p.m.. Members may come as early as 10 a.m. to conduct research before the meeting. 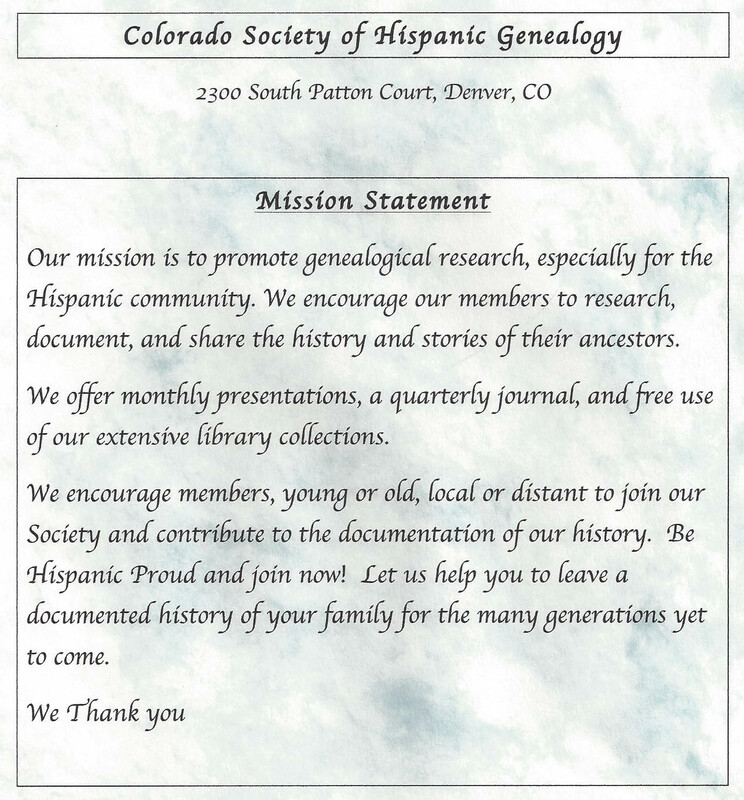 The CSHG Research Library is open every Saturday from 10 a.m. to 1 p.m. Our library is located in the Christ the King Lutheran Church at 2300 South Patton Court, in southwest Denver. For more information, contact the CSHG Archives Director. The CSHG Research Library has access to the internet which allows members to view online census records and other genealogical and historical websites. CSHG Executive Board Meetings are held on the 3rd Saturday of the month at 11:00 a.m. if the Board President calls for a Board Meeting, Meetings are held at Christ the King Lutheran Church, 2300 South Patton Court, Denver. CSHG members are welcome to attend. CSHG is a non-profit organization with tax-exempt status under section 501(c) (3). Donors, corporations and foundations interested in making gifts or grants under section 501(c) (3) may obtain a copy of the CSHG's exemption letter from the CSHG President. Please contribute to CSHG. This nonprofit research site is a member of The USGenWeb Project, and hosted at no charge by USGenNet, a nonprofit genealogical-historical Safe-Site Server solely supported by tax-deductible contributions. This site makes no claim to the copyrights of individual submitters, and is in full compliance with USGenNet's Conditions of Use.